Pitching at single-A Charleston, S.C. in 1988, Darrin Reichle achieved a feat few pitchers achieve. Then he did it again. He pitched a nine-inning no-hitter May 14, then a seven-inning no-hitter 16 days later. "Darrin is big-league material," Reichle's pitching coach at Charleston, Gary Lance, told The Los Angeles Times later that year. "From what he's done already, and just watching him, you can't doubt that he's a rare breed." 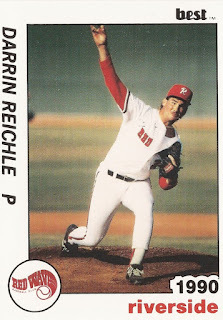 While Reichle did a lot that year in 1988, his second season in the pros, Reichle didn't get to do much else. His was a career that spanned six seasons, getting as high as AA, but no higher. 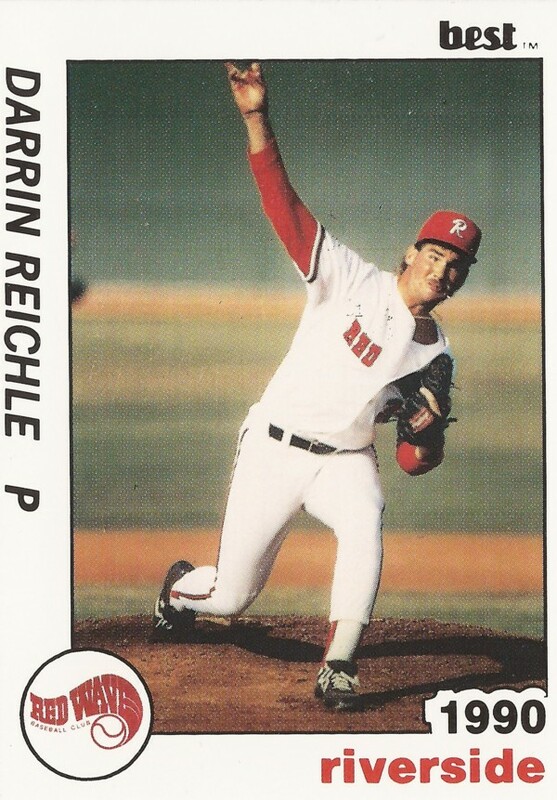 Reichle's career began in 1987, selected by the Padres in the fourth round of the draft out of St. Leo University. He played that first season at short-season Spokane and single-A Reno. At Spokane, Reichle went 4-1 in 10 starts, posting an ERA of 2.96. He picked up his loss in an early July contest, allowing the first three batters to score. He got his second win days before, giving up three hits in six innings. His catcher in that game, Bob Lutticken, praised his pitcher afterward to The Spokane Spokesman-Review. "He's a great pitcher," Lutticken told The Spokesman-Review. "I love catching him. He throws one of the 'heaviest' balls I've ever caught. It hurts my hand." In a four-game look Reno that year, Reichle had difficulties, giving up 19 runs in 12.1 innings. He also picked up three losses in four outings. But then came 1988 and single-A Charleston, S.C., those two no-hitters and a hot start. Despite that start, the Padres chose to keep him in single-A. Team farm director Tom Romenesko told Reichle's hometown Orlando Sentinel he needed work. "He's not ready to move up," Romenesko told The Sentinel. "If you look at the numbers he had at Reno last year after we moved him out of the rookie league, you'll know what I mean." Reichle stayed at Charleston for the remainder of the season, going 10-3, with an ERA of 2.84. For 1989, though, he only moved to single-A Riverside. There, he went 10-10, with an ERA of 4.15. And he returned to Riverside for 1990, starting just six games, going 0-2. It was in 1991 that Reichle saw his only time at AA. He went 4-3 in 14 starts, with a 5.02 ERA, finishing out his affiliated career. One final season in independent ball in 1995, playing with Aberdeen in the Prairie League, and Reichle was done. He finished strong, picking up 14 wins in the independent circuit, with no losses.